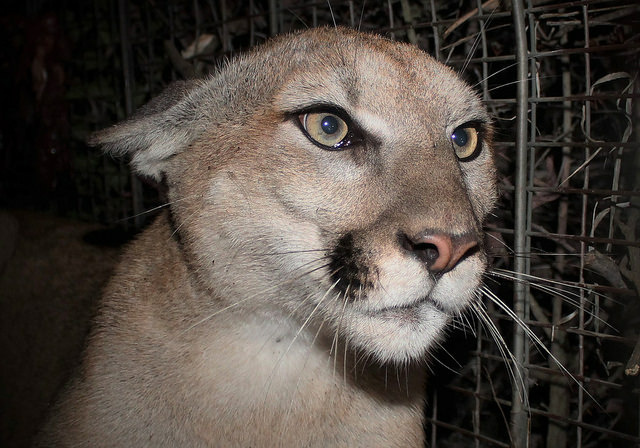 Mountain lion P-65, a subadult female, was captured in the central portion of the Santa Monica Mountains in March 2018. What's Los Angeles without a weekly mountain lion story? The current cougar in the spotlight is P-65, which wildlife biologists discovered earlier this month in the central region of the Santa Monica Mountains. A National Park Service researcher spotted the uncollared lion on a remote camera and was later able to capture her in a cage, said Kate Kuykendall, a spokeswoman for the Santa Monica Mountains National Recreation Area. Researchers took samples from the young female puma, fitted her with a GPS collar and released her back into the mountain range. They estimated her to be a year and a half old. "We look forward to learning (from DNA) how she may be related to other lions and where she'll settle into a home range," Kuykendall said. "Because we've had very few breeding males over the course of our study, we are particularly interested in finding out who the father is." Park officials shared a video of P-65 returning to a spot where she stashed a deer carcass. In late February, a male mountain lion, dubbed P-64, was documented successfully crossing the 101 Freeway not once but four times in the span of two weeks. He also made it across the 118 Freeway, a roadway that has claimed the lives of several pumas in recent years. There are only about 15 cougars in the Santa Monica Mountains, and the small population is rapidly becoming inbred, researchers say. Within 50 years, the local lion population could go extinct due to inbreeding, according to a 2016 study.